OAKLAND, Calif. — “It’s never going to be a regular game for me,” said Kevin Durant ahead of Wednesday’s clash between Golden State and Oklahoma City at Oracle Arena. Watch live streaming coverage on WatchESPN and televised on ESPN at 10:30 PM ET. Live online streaming also included coverage in Spanish and Multiview action on the ESPN3 schedule. Follow NBA Livescores and other livescores today. 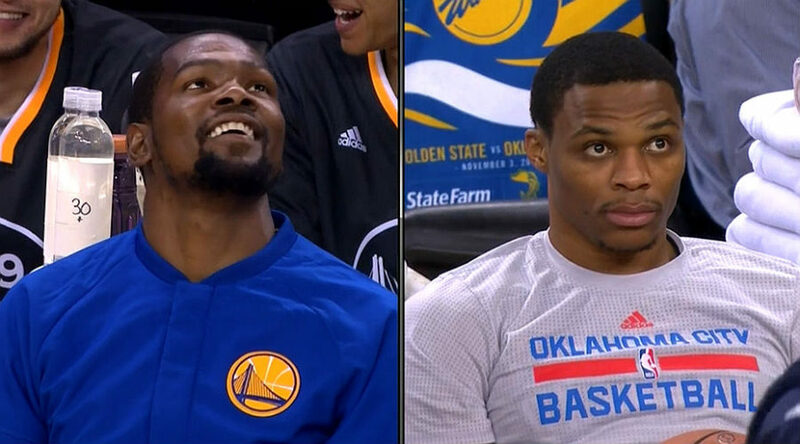 Watch For Durant v Westbrook? The matchup will be round 2 between the Thunder and the Warriors this season, while as expected, all eyes will be on the on-court interaction between Durant and his former Oklahoma City right-hand man Russell Westbrook. Golden State (35-6) won the first battle of this series this season 122-96 on Nov. 3 with Durant poured in a game-high 39 points, while Westbrook finished with 20 points and 10 assists, but shot just 4-of-15 and turned the ball over six times for the Thunder. The Warriors enter this game on the back of a convincing 126-91 victory over the Cleveland Cavaliers on Monday night for four straight wins and eight in the last nine games overall. Golden State leads the league in points per game at 117.7, while Steve Kerr’s men also top the league’s assist table at 31.3 per game. The Western Conference powerhouses are also in the top five in rebounds per game this term with 45.3. Oklahoma City (25-18) meanwhile, is coming off a heavy 22-point loss to the Los Angeles Clippers on Monday night and has dropped two of the last three games on this six-game road trip. Westbrook, who scored 24 points in three-quarters in the loss to the Clippers, will seek his 21st triple-double this season after having trouble finding the net Monday night. The All-Star point guard is averaging a triple-double with career-highs all across the board at 30.7 points, 10.5 rebounds and 10.3 assists per game in 29.73 minutes per contest half way through the 2016-17 NBA season. The Northwest Division outfits will again be without star centre Steven Adams, who has been ruled out for Wednesday’s game while he remains in the league’s concussion protocol. Forward Jerami Grant started in Adams’ place against the Clippers and could keep his spot, although head coach Billy Donovan could insert Enes Kanter in that position to give his team some more protection under the basket from the get-go. Joffrey Lauvergne, another big man who featured a lot in the defeat to Los Angeles and had 13 points and nine rebounds, is also another option for coach Donovan after he played a bench-leading 30 minutes on Monday. Meanwhile, five Warriors players, led by Durant at 25.8 points, are scoring in double figures this season. Point guard Stephen Curry is averaging 24.6 points, Klay Thompson is scoring 21.4, while forward Draymond Green is putting out 10.7 points, 8.6 rebounds and 7.7 assists per game this campaign. Follow livescores and get more information on the official Oklahoma City Thunder and the Golden State Warriors websites.